We just finished having our very first Book Tasting for 2nd grade! All 2nd grade classes had the opportunity to "taste" various realistic fiction book series. The purpose of a book tasting is to generate interest in different book series. As they traveled around the media center, they created a Realistic Fiction Trail Mix. The series they tasted were: Ready Freddy, Judy Moody, Fudge Series, Cam Jansen, Horrible Harry, and Jigsaw Jones. The kids had a blast! Drama students promoted their play "Phantom Tollbooth" and helped us get the day started. A great day starting with the Band helping the car riders! 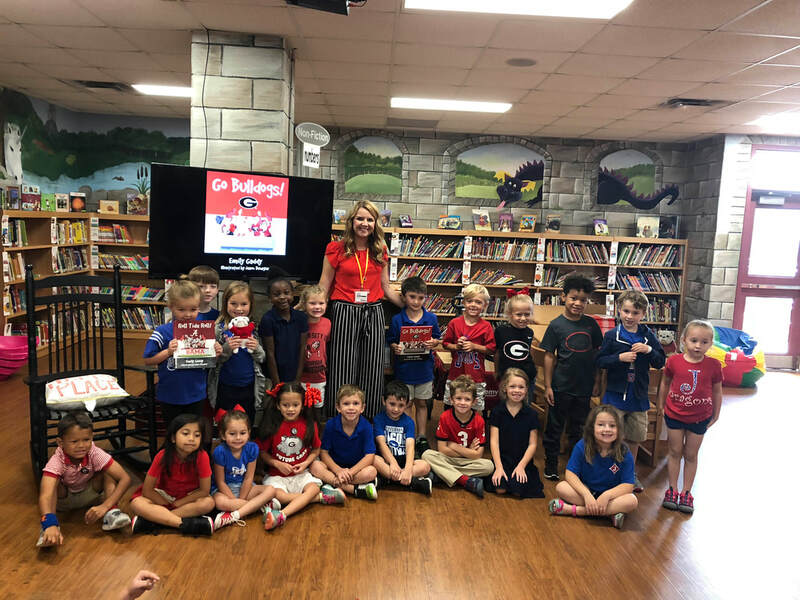 Author Emily Gaddy read her book Go Bulldogs! Thank you Varsity Cheerleaders for helping the car riders and reading to us!